THE partial United States (US) government shutdown finally came to an end last week, and more than 800,000 non-essential government employees returned to work. USDA staff have returned to work following the partial government shutdown. 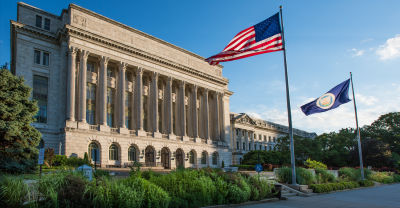 This means that the United States Department of Agriculture (USDA) is back up and running, and staff are frantically collating all the reports that were due over the past 35 days, as well as those due in the near future. A lot of information will hit the market in a short period. Around 62 reports that measure US farm production, foreign purchases of US commodities, the size of domestic stockpiles,and US plantings of winter wheat were all delayed by the shutdown, and they will be published in coming weeks. The other significant news last week was the return to the market of Egypt’s state grain buyer, the General Authority for Supply Commodities (GASC). This was the first tender since GASC secured a new credit facility, updating its payment terms in a bid to attract more selling interest, and to lower costs at its tenders. sign of a slowdown in the pace of Russian wheat exports. Russian offers were more than US$255/t free on board (FOB), simply too expensive compared with Romanian offers at just under $251/t FOB and French at almost $248/t FOB. GASC booked 180,000t, or three cargoes, from each origin for March 11-20 delivery. This is the first sale of French wheat into the GASC tenders since July 2017. The average delivered price came in at $262.77/t cost and freight (CFR), a fall of $2.17/t on the January tender price. US wheat was offered at $243/t FOB, but could not quite compete on a CFR basis, due to the unfavourable freight spreads compared with those for France and Romania. However, one of the first USDA reports to hit the wires was the US Weekly Sales Report for the week ending 20 December 20. It revealed two cargoes of US Hard Red Winter (HRW) wheat had been sold to private Egyptian buyers. This is undoubtedly a good sign for the competitiveness of US wheat into Mediterranean, African and Middle Eastern destinations, and maybe a precursor for more such news as the delayed USDA reports are released in coming weeks. Another factor favouring the US presently is the fall in international sea-freight rates. This is reflected in the dramatic fall in the Baltic Dry Index (BDI) over the past month. The BDI is a shipping and trade index created by the London-based Baltic Exchange, and was first published in January 1985. It measures changes in the cost of transporting various goods around the world and gives investors and the trade an insight into supply and demand trends in the global dry-bulk shipping market. The index is calculated using charter rates for the full range of ship sizes, from Handysize (ships that can carry 15,000-35,000t deadweight) to Capesize (ships that can carry more than 100,000t deadweight). The figure for each ship size is based on an average of rates on a series of routes representative for each size. 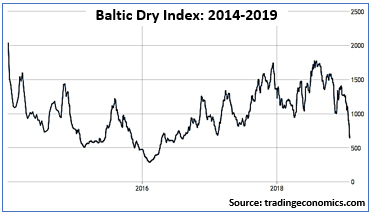 The BDI is traditionally a good indicator of global economic health and worldwide demand forcommodities and raw materials, such as iron ore, coal, steel cement and grains. The fact that the BDI focuses on raw materials is crucial because the demand for raw materials provides a glimpse into the future. The index has lost more than 50 per cent of its value since the beginning of the year, and is now at its lowest level in almost two years (see chart). January is historically slow for dry bulk markets, particularly in the Pacific, as the Far East prepares for Chinese New Year. However, this year the Atlantic rates have also fallen significantly. The short-term sentiment has been intensified by two factors: Firstly, the lack of soybean exports from the US to China as a result of Don’s Party (US-China trade war); and secondly, the tragic dam break at Vale’s Corrego do Feijao iron-ore mine in southeastern Brazil. This is a huge mine, and the disaster has sparked concerns that it could lead to a substantial decrease in iron-ore production and exports from Brazil, which will impact the Capesize sector of the shipping market. One thing is certain: the decrease in sea-freight rates is increasing the competitiveness of the US wheat into important markets in the Mediterranean, African and Middle Eastern regions. These are markets that have been dominated by Russia so far this season. The US needs to find demand for wheat. The challenge is the amount of open old-crop demand in those markets is shrinking rapidly as new crop Russian and Ukrainian wheat will be available in July.